This recap covers the Council Work Sessions on August 20, September 1, September 10, and September 16; the Council Meetings on September 1 and September 16; the EDA meetings on September 1 and 16; and the City Code Review Task Force meeting on August 27. Work sessions in August and September were relatively light on content as the focus was really on the budget process. Phase 15 Street Reconstruction – We did talk in depth about the Phase 15 street reconstruction process. As a reminder, the city is in Phase 15 of 16 phases to completely rebuild all of the streets in the city. The affected area for Phase 15 is around Twin Oaks Park in the north part of the city. There are a number of steps to these projects, and we are at the part where we are reviewing the feasibility report, which explains the project in detail. Residents impacted by the construction (and the assessments that come with it) will have several opportunities to provide feedback to the council, and will receive direct communication about the process. On September 1 we voted to set the preliminary budget for the city for 2016. We set a number in September, and then we can’t raise the amount higher than that, but we can lower it. The final number is set in December. The preliminary budget for 2016 was set at just over $13 million, of which about $9.5 million will come from property taxes. This is a 3% increase (or roughly $300,000) over 2015. The preliminary budget we adopted keeps city services level to where they have been while providing for some basic increased budget pressures (like wages and health insurance). I hope to be able to provide some more details about the budget soon, in an easy to understand format. I don’t anticipate the bottom line number will change dramatically, but we may shift where some of the money is allocated to better fit our long term needs. In the long term, I hope to be able to pursue a new approach to the budget process that is more transparent and easy to understand for everyone. The process in use today, in my opinion, is too complicated, too time consuming for all involved, and isn’t structured in a way to get meaningful public feedback. Herzing University 50th Anniversary – The mayor made a proclamation recognizing Herzing University for their 50th anniversary. Herzing has a campus in the north part of Crystal, and their President John Slama is a very involved member of the Crystal community. Almsted’s Fresh Market Day – The mayor made a proclamation that September 22, 2015 was Almsted’s Fresh Market Day in Crystal, in recognition of Almsted’s 15th anniversary in Crystal. Owner Jim Almsted is also a very involved member of the Crystal community, and Almsted’s is very supportive of many community events in Crystal. Deputy Chief Mike Meehan Resolution – The council passed a resolution thanking Deputy Chief Mike Meehan for his service to Crystal and congratulating him on his new job as chief of the South Lake Minnetonka Police Department. Preliminary Levy – As I mentioned above, we set the preliminary levy amounts on September 1. CenturyLink/Undergrounding of Utilities – The ongoing saga regarding the change in an ordinance to allow new utilities to be added to existing poles continued with ordinance readings on September 1 and 16th For background, see here. I voted against it on the 1st, and for it on the 16th. My opposition was always to the way CenturyLink handled the process, not necessarily to the ordinance change, so I figured by the 16th I had made my point abundantly clear to everyone involved and was OK voting for the end product. City Manager Evaluation Process – Earlier this year the council identified deficiencies in the way the City Manager position is reviewed and evaluated, and determined we would hire a consultant to help correct those deficiencies. The council authorized the mayor to enter into a contract with one of the firms we received bids from. The existing process does not provide meaningful actionable feedback or allow for clear goal setting. Closure of Brunswick Avenue – The council authorized the closure of a portion of Brunswick Avenue near Basset Creek Park. The long term goal is to close the entire portion of the road that goes through the park. Fun fact- it’s the only gravel road remaining in Crystal. EDA Levy – Although the EDA is made up of the city council members, the The EDA is a separate entity with its own levy (which is much smaller than the city tax levy, and is capped by state law). The EDA set the levy amount to $246,000, which is below the cap of about $269,000 and is a 3% increase over last year. Lot Sale- The EDA authorized the sale of a lot at 5626 Vera Cruz for new home construction. New Acquisition – The EDA authorized the potential acquisition of a foreclosed home at 4354 Xenia Ave. The City Code Task Force met for the third time and is really starting to gain momentum. They will be presenting their first report to the council on October 1, and have already reviewed three chapters of the city code. Glow Golf – I golfed in the Beyond the Yellow Ribbon Glow Golf tournament on September 3, and yes, golfing in the dark did somehow improve my game. Traffic Symposium – The city held our first Traffic Symposium on September 10. See a quick recap here, with more to come. West Metro Fire Recognition – I attended the West Metro Fire District’s annual recognition event on September 12. It was a great event, and was fun to see so many great firefighters recognized for their work. I invited West Metro to present about the award ceremony at the September 16 council meeting so we could get some public recognition for the team at West Metro. Halfway Happy Hour – The Light of Crystal’s Halfway Happy Hours are back. Events are on the 15th of each month and they have all the locations selected for the rest of the year. Connect with the Light of Crystal on Facebook here. 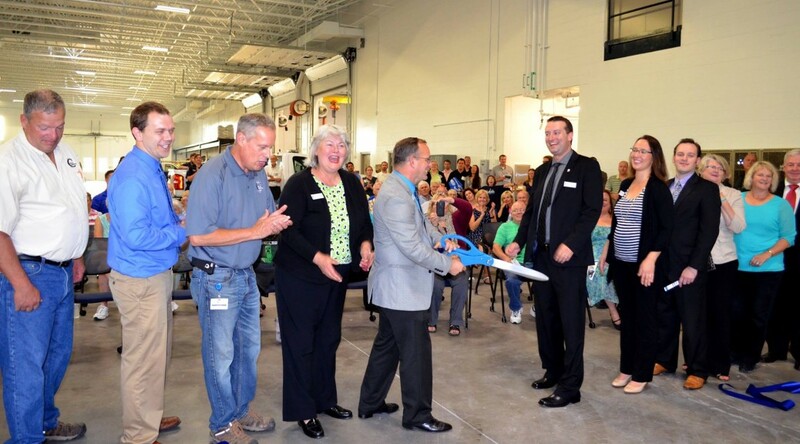 Public Works Ribbon Cutting – The ribbon cutting for the new Public Works facility was on September 16. See some pictures from the event here, including a semi-creepy picture of the mayor looking like he’s going to cut me with the oversized novelty scissors. Run for ROCCO – The Crystal Crime Prevention Board’s Run for ROCCO 5k event is Saturday September 26. Walk-a-Thon – Meadow Lake Elementary’s 4th annual walk-a-thon is October 3 at 9am. Bouncy houses, petting zoo, face painters, and of course, walking. A special note of congratulations to my colleague and friend Elizabeth Dahl on the birth of her daughter, Charlotte. The next council meeting is October 6.